Meg Marotte, farm partner at Singing Tree Garden. Image courtesy of Singing Tree Garden. Local urban farmers in Detroit have recognized that the whole is often greater than its parts—and so they’ve combined forces to strengthen the local food scene and their own bottom lines. Six Detroit farm businesses have combined to create City Commons, a cooperative in which members support the six farms with a purchase of seasonal shares of fresh produce and other farm products. Members receive a weekly box of fresh-from-the-farm, organically grown food that has been raised entirely within Detroit’s city limits. The coop model is advantageous for customers who like a wide variety of seasonal fruits and vegetables. It’s also advantageous for independent farmers who are trying to make a living exclusively by farming—especially those who share a passion for fresh, local food for an urban population. 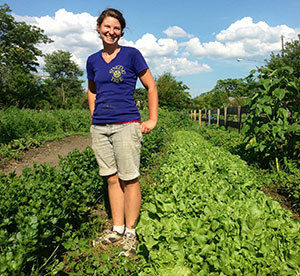 Minni Forman founded City Commons in 2012 with fellow AmeriCorps members she met while working with the Greening of Detroit, a nonprofit that works to support reforestation and urban farming in the city. According to Forman, the idea of a cooperative CSA made sense from a business perspective. Alice Bagley was also instrumental in founding City Commons CSA. She was one of the only founders who had previously run a CSA, and her primary role in the organization is bookkeeping. There’s strength in numbers, she points out. “We help each other because we all bring our own networks of family and friends,“ she says. “And we all grow slightly different things.” Most of the farms grow fruits and vegetables, but some also provide honey, poultry, and fish. To assist customers who may not be familiar with every variety of food contained in the box, each weekly pick-up comes with recipes, information and serving suggestions. A full share includes a box of produce every week for 20 weeks and costs $425 for the season. To make their produce affordable to all, the CSA also offers half-shares, work-trade agreements, and payment plans for customers receiving government assistance through SNAP. According to Forman, the majority of City Commons’ customers are professionals who work in the city and care about local agriculture. In order to reach out to local businesses, the CSA now offers on-site delivery to businesses in the city that sign up a certain number of employees. Forman, Bagley, and their partners share a strong passion for growing food in the city, though they have learned some valuable lessons about making a cooperative function on a day-to-day basis since they first partnered in 2012. According to Alice Bagley, a co-op of six farm operations is a comfortable situation for the present, and they have no current plans to expand. Overall, however, Forman and Bagley are optimistic about the future of food in Detroit and the commitment of its citizens to sustainable urban agriculture.